A fanatic general is plotting to conquer the galaxy, and only Jules Rammis can stop him. It’s not that Jules looks for trouble. As an astrobiologist, he’d rather study the intriguing alien species, Blackroot. But his telepathic abilities seem to attract the wrong aliens - and people. This time it’s General Ki Rowdinth, crazed leader of the Vermakt people. The psychotic tyrant intends to extort the combined gold depositories of Earth and all the colony planets to finance an army that will rule the worlds. If the Worlds Government doesn’t agree to Rowdinth’s demands, he vows to engage a dark-energy weapon that will destroy Earth. It looks like only Jules, with his powerful telepathic abilities, stands between the rat-like general and the total annihilation of our homeworld. 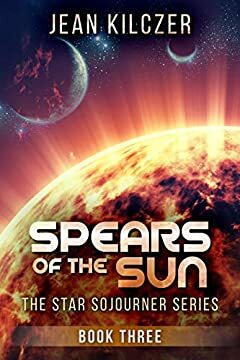 Spears of the Sun is a standalone novel and can be enjoyed even if you haven't read other books in the series.